Vehicle A-Pillar Panel – The post that runs down along the sides of the windshield in front of the front doors. 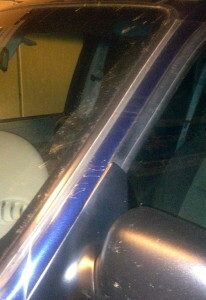 This is one of the places that hail dents can hide. Severe dents are obvious on the a-panel, but small dents are often overlooked by vehicle owners as well as beginning technicians. Hail repair on the vehicle a-pillar can be complex. It is almost always double paneled which requires the use of the glue-pulling method of paintless dent removal. Technicians who are skilled in the art of blending are usually able to perform these repairs quicker and with better end results. Dents on A-Pillars are often repaired while looking in only one direction which can leave a pitted look as a result of leaving a line in the dent. Interior A-Pillar often needs to be R&I in order to lower the headliner. 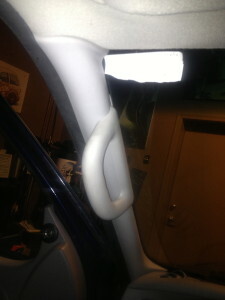 The interior A-Pillar trim is usually held on by clips or a screw or a combination of the two. The trim needs to be carefully removed to prevent marring of the plastic. Wiring is often hidden behind the A-Pillar. Caution needs to be taken not only when removing the trim, but re-attaching it as well to avoid damaging the wires and connectors. Read about the next term: Atlas Glue Tabs – Special plastic tabs used to repair dents from automobiles using the glue pulling process.